Situated 3kms from Tirunelveli at Palayamkottai is one of the oldest and gorgeous church named Holy Trinity Cathedral built by Rev Rhenius in 1826. It took only 175 days for its structure at an expense of Rs.2000/- that was given as donations by the people belongs to diverse religions . With the way of time, further developments, expansions and reconstruction works have been made. The major attraction of the church is the large royal tower called Oosi Gopuram measuring a height of 158 feet and it is considered as the sight of Tirunelveli city. In that tower, there is a clock that was set during 1850 and is still in working condition. Another specialty of the church is a bell which was imported from England and installed in the same period. 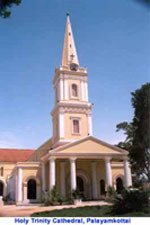 The church was raised to the position of a Cathedral in the year 1940 by the Bishop Stephen Nellai. The Cathedral plays a imperative role in religious uplift of the people along with the material uplift of providing education, distributing free food and clothing and helping them to build their houses. This incident occurred on 18th September which is celebrated as a festival. People used to keep this statue in a chariot and come around this town to bestow the blessing of Mary to the people of Uvari. Due to sea erosion the old church got damaged. Therefore the people decided to construct a new church for which the foundation stone was laid down by Fr.Thomas in 1970, 25th January and the work was finished on 1974. 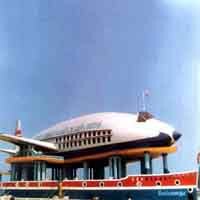 This church designed as a ship, is called Kappal Matha church after its design. It is beautiful church facing the blue sea. The waves rolling near this church gives us an impression that this ship shaped church is sailing on the sea which is a feast to eyes.